Vascular problems in children's developing brains require special individualized care in an experienced pediatric center. At the Pediatric Cerebrovascular Neurosurgery at Texas Children's Hospital, we have a multispecialty team working together to offer the best diagnostic and treatment options for our patients. There are few programs of this kind, since pediatric stroke and pediatric neurovascular diseases are relatively rare. I run a multidisciplinary pediatric neurovascular conference at Texas Children's Hospital, where we discuss pediatric neurovascular cases and obtain consensus for best treatment recommendations for each child. Specialists involved in the spectrum of care include neurosurgeons, endovascular neurointerventional neurosurgeons, neurologists, neuroradiologists, critical care intensivists, anesthesiologists, physical medicine and rehabilitation physicians, as well as hematologists, and geneticists. We work in collaboration with the Vascular Anomalies center and the highly respected genetics program at Baylor College of Medicine. In addition, we offer participation in our tissue bank, where surgical samples after AVM resection and cavernoma removal are stored securely for future study. Sandi Lam MD MBA is the pediatric neurosurgeon with a special focus on taking care of children with cerebrovascular disorders. Care does not start and end with surgery: we focus on refining a program to offer patients and families the best outcomes and the most peace of mind. That includes team discussions for surgical planning, as well as coordinating with genetics counselors to talk about what these diagnoses mean to the rest of the family. Peter Kan MD MPH is a Baylor College of Medicine faculty neurosurgeon who has special expertise in endovascular interventions. His pediatric endovascular presence is integral to the team's ability to treat pediatric cerebrovascular disorders. Our team is led by Dr. Nilesh Desai. Texas Children's Hospital has a strong pediatric radiology department​ with a group of dedicated, subspecialty-trained pediatric neuroradiologists. Not only are they focused on neuroimaging, they understand the special conditions in infants, children, and young adults. These conditions often have nuanced appearances on imaging throughout a child's development. 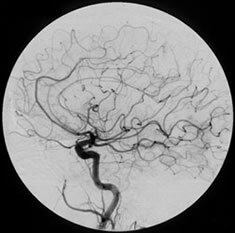 Pediatric neurologists with special interest in vascular conditions and strokes focus on diagnosis and medical management of cerebrovascular diseases in children. Aside from pediatric stroke/vascular neurologists, our pediatric neurology department also has other super-specialists in genetic, neonatal, inflammatory, immunologic, and epilepsy neurology disorders. There are few places in the country with integrated services of Pediatric Physical Medicine & Rehabilitation doctors along with their team of therapists and support services. Whether the needs of our patients are are as inpatients or outpatients, the PM&R team helps kids heal and reach their potential.